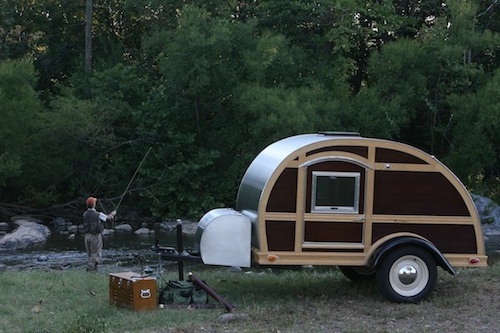 A woodie teardrop trailer redefines camping. 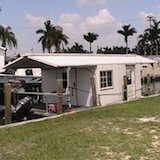 In the 1940's these little trailers became an instant classic. Back then they were handbuilt in people's garages from extra war materials. It gave people the ability to travel light with everything they need. With a teardrop camper you are only bringing what you truly need. Nothing more. This means no wasting money excessively. No spending time doing maintenance and repairs. These little campers are a statement of freedom. 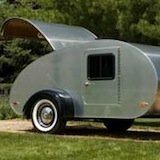 Silver Tears is a company in Virginia that builds custom made teardrop campers. I particularly love their woodie model which you can see above. It's available in two different sizes: 4' x 8' and 5' x 10'. It's made with Mahogany wood on the outside and wood veneer on the inside. 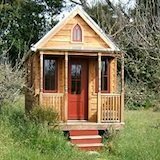 Depending on what size you choose, you can fit either a full or queen sized bed inside. 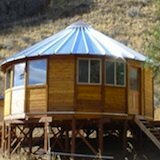 There are two doors with windows and screens to allow the fresh breeze to run through. Plus you've also got a roof vent too. It weights about 1000 lbs and the axle has a 2200 lbs capacity.